Sunseeker East Coast Australia are pleased to present exclusively this exceptional 2014 Predator 80. "Limitless” a rare and unique opportunity. Sleek and stylish sophistication, boasting an extensive inventory of extras and quality options. Powerful performance along with exceptional hull design ensures the ride is exhilarating with outstanding comfort! Featuring understated elegance throughout with exquisite timber contrasts and leather finishes. Boasting 4 beautifully appointed staterooms all with own ensuite plus private crew quarters aft. The comprehensive inventory includes Sleipner Fin stabilisers, hydraulic bow and stern thrusters, remote yacht controller, state of the art Simrad electronics package, extensive entertainment systems throughout, climate controlled, glass electric sky roof, hydraulic swim platform, tender garage housing the Williams 455 jet tender, bow sun lounges and dining, aft deck sunbed, lounges and wetbar, underwater lights, passerelle, Glendenning cablemaster, full covers, parasol and so much more. 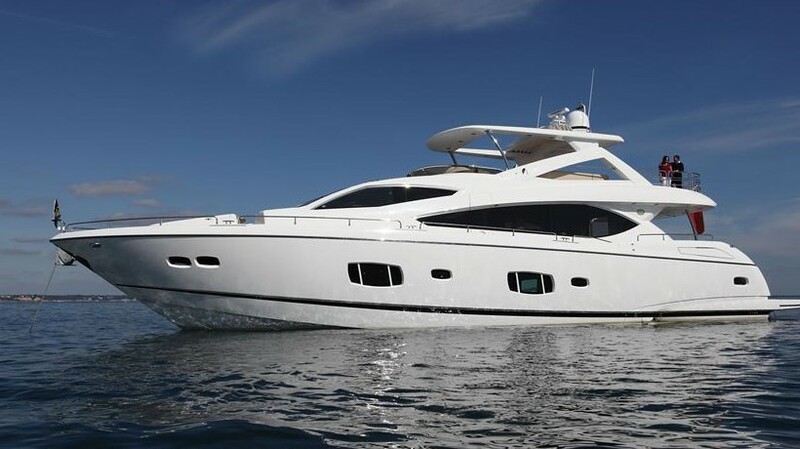 An exceptional example of the quality and performance Sunseeker are renowned for. SYS Yacht Sales is pleased to assist you in the purchase of this vessel. This boat is centrally listed by Sunseeker Australia.